Yes, the Heatons is getting it’s very own map! In order to achieve our aim of generating greater visibility for the Heatons as a whole, the 4HTA is producing a printed map which will feature local business, services and transport links. There will be a business listing on the reverse of the map featuring local business information, contacts etc. We are asking local businesses to sign-up for a listing on the map which will be widely distributed throughout the Heatons and beyond – not only do we want to remind the local community how great the Heatons is and the fantastic independent businesses that operate here, but we want to ensure those in surrounding areas also know and pay us a visit! 4HTA members benefit from a significant discount on a listing spot, but the option for a listing is open to any Heatons business. For more information or to sign-up for a listing, just drop us an email. As a business association, one of our key roles is to support local businesses in encouraging the community to shop local by choosing Heatons businesses & services before looking elsewhere. Our Heatons Friend scheme has been in discussion for some time and we are now working on getting it up & running. What is it? Basically, it is a shop local scheme where members of the community sign-up to be a Heatons Friend, receiving a membership card, quarterly newsletters covering local business & community news, the option to be added to a volunteer list to help at local events, and discounts at a range of 4HTA member businesses. As our other projects move forward, we also hope to offer more benefits to those who become a Heatons Friend. A listing will be produced of all those businesses taking part in the scheme and regular updates on new offers will be provided via email/newsletters. If you are a 4HTA member and have not yet been in touch to let us know you would like to be part of the scheme, just drop us an email. 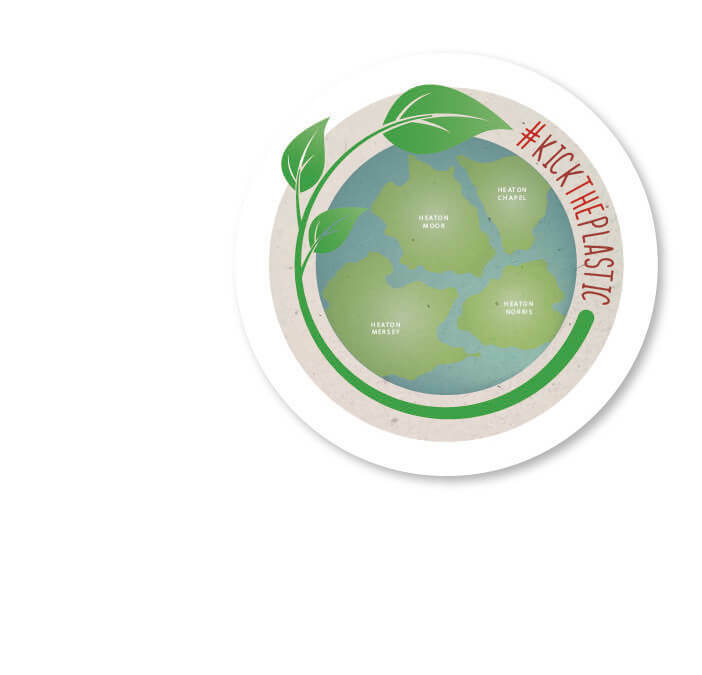 #KickThePlastic is already up & running and we are looking at how we can expand & develop this initiative. The Heatons Map and Heatons Friend scheme are still in planning, but we hope to be able to launch both in the New Year. This is a very exciting time for the 4HTA and we very much hope our projects will be welcomed & supported by local businesses & the local community. Have an idea for a project for the Heatons you would like to see the 4HTA concentrate on in the future? Get in touch – we are all ears!